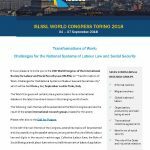 It is our pleasure to invite you to the XXII World Congress of the International Society for Labour and Social Security Law (ISLSSL) on “Transformations of Work: Challenges for the National Systems of Labour Law and Social Security” which will be held from 4 to 7 September 2018 in Turin, Italy. The World Congress will certainly be a great occasion for an international debate on the latest trends and issues in the changing world of work. The following main themes will be presented at the World Congress and are the result of the seven international research groups created for this event. Please refer also to the Call for Papers. In line with the main themes of the Congress, several key topics will be presented and discussed during the parallel sessions, among others: Future of Work; Labour law and digits in the second machine age; Collective Labour Law; the Role of Social Dialogue and Labour Law reforms; the Enforcement of Labour Legislation. Registration is now open at XXII ISLSSL World Congress website. Special fees for early bird registration will be offered until mid-February 2018! We are looking forward to meeting you in Turin on 4-7 September 2018. Posted in ISLSSL Events, ISLSSL World Congress XXII, Meetings & Events on December 11, 2017 .